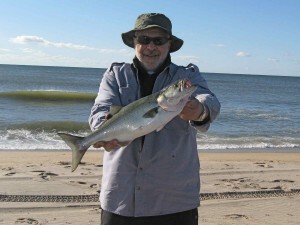 At times, surf fishing approaches a religious experience for me. No more so than on Rosh Hoshanah. Not because I have “seen the light”. Rather, because I have probably caught more fish in the surf on the Rosh Hoshanah holiday than any other day of the year. Given, Rosh Hoshanah is the day I fish most consistently since it always falls during the prime shank of the autumn surfcasting season. Then again, I have to believe there is something else going on. You be the judge. This year, Rosh Hoshanah was early—September 18-19–and my season—which typically kicks off on Labor Day weekend—was late. But the two converged very nicely on a sunny and warm weekend tailor-made for bathing suit and barefoot sandy beach surfcasting. 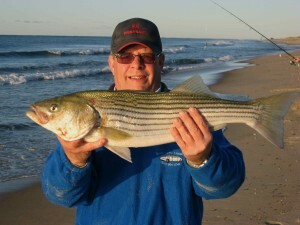 And like years past, it produced a bumper crop of bluefish and striped bass for the table. I call that old time religion. successful clamming and blue claw crabbing expeditions. Bob even turned a single whelk taken from the Northwest Harbor clamming grounds into the sweetest, most tender Scungilli salad I ever tasted. But alas, no Rosh Hoshanah magic with finned species for Bob on this trip. By the time I arrived for a Friday session, there was a stiff WNW wind on the beach and the surf was dirtied up and choppy. We hunted all the usual locations, but the only productive use of my time was getting my beach permits up to date. Natalie caught the bullet train from NYC and joined us for a dinner of store bought (but locally caught) Mako shark steaks prepared Cajun style on Frank’s grill. With sundown, the Rosh Hoshanah holiday was officially upon us and it was as if the fish knew. Because on Saturday morning, everything changed. up shortly thereafter but dropped his fish at the waterline. Frank and Keith were in the water by now and Keith had a bent pole but trouble cranking his reel. It turned out his main problem was a 28-inch striper that inhaled his silver Kastmaster. Keith brought in the first keeper of the season on the last day of his fishing trip. Another High Holy Days miracle. He added a bluefish for punctuation and our cooler was filled for the lunchtime feast to come. Though the birds kept circling and diving on bait for the rest of the morning The fish moved off to deeper water. Our action lasted less than an hour beginning at 7am on the last of the incoming tide. With the lull, we repaired to Frank’s house and a fish cleaning party where we discovered the bass was feeding on tiny baby crabs and clams while the bluefish was gorging on tiny weakfish. Lunch was grilled fresh striped bass, Long Island BLT’s (bluefish, lettuce and tomato sandwiches), served on bagels with a grand salad by my niece Gina. 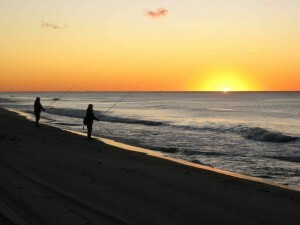 After Bob and his wife Pat left to catch their plane, we returned to the beach but never raised another fish. For dinner, we cobbled together a ragu comprised of Natalie’s red sauce laden with striped bass morsels, bluefish filets, a handful of Frank’s clams and a bag of large shrimp. We tossed this seafood melange over linguine and supplemented with another spectacular Gina salad. Dawning gloriously, Sunday morning brought the same spectacular weather but different players. Big Bob Wilsusen joined the fishing party as did nephew Chris in place of Keith who was packing for his return home to Santa Barbara. Frank and Chris took off for the scene of Saturday’s crime while I waited for Bob who was slightly delayed when he fought off and killed Bambi who attacked his Land Rover Defender on Springs Fireplace Road. Unfortunately, Bob did not keep the meat. glass. The birds were active but the fish were absent. We searched east and west until 8am, when the fish began splashing up in earnest. We chased a school west to Napeague State Park and everyone got well. 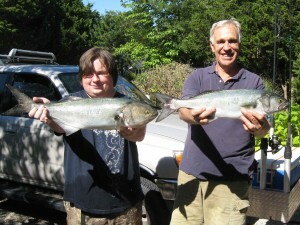 Chris and Bob competed for biggest-fish honors with two long, fat gangster blues. No bass, but the four of us caught well over a dozen fish. We took home 10, which were all earmarked for our table and those of friends on both coasts. Another BLT fish grill for lunch and the weekend was suddenly over. Frank and family returned to California the next day, but they will be back for another surf fishing session in October. Next up? September 28 will bring the lesser known, but up-and-coming and nearly satisfying Yom Kippur Blitz. God is good. This entry was posted on Tuesday, September 22nd, 2009 at 4:22 pm and is filed under Uncategorized. You can follow any responses to this entry through the RSS 2.0 feed. You can leave a response, or trackback from your own site.